Which is your favorite season of all? well most of us secretly adore winters because there is snow and snow all around, and also winters never bother us as much as summers. Well in summers we like to stay chill and feel at home, because the hot winds literally make one troubled, making hair messy, sweaty and one feels lethargic under the sunlight. Wear biggie big hats, sunglasses, use sunblock SPF60 to protect you from heat wave, and also in summers don’t forget to hydrate yourself as much as you can because summers are draining, they leave you all useless and lazy so to kill the summer hotness you must take at least 8-12 glasses of water, juices and all those cool things to make you feel easy and refreshed. When I say ‘SUMMER’, the first thing that comes to one’s mind is ice cream, yes because it feels so cool to devour ice-cream cones, waffles and all those chocolaty Nutella scoop in the burning weather. Which ice cream flavor you like? Have you tried making ice cream at home? Well it is super easy using condensed milk along with minimum ingredients and there you are. These days people also make frozen ice cream popsicles at home for their kids and children, and ice lolly is everybody’s favorite, no? 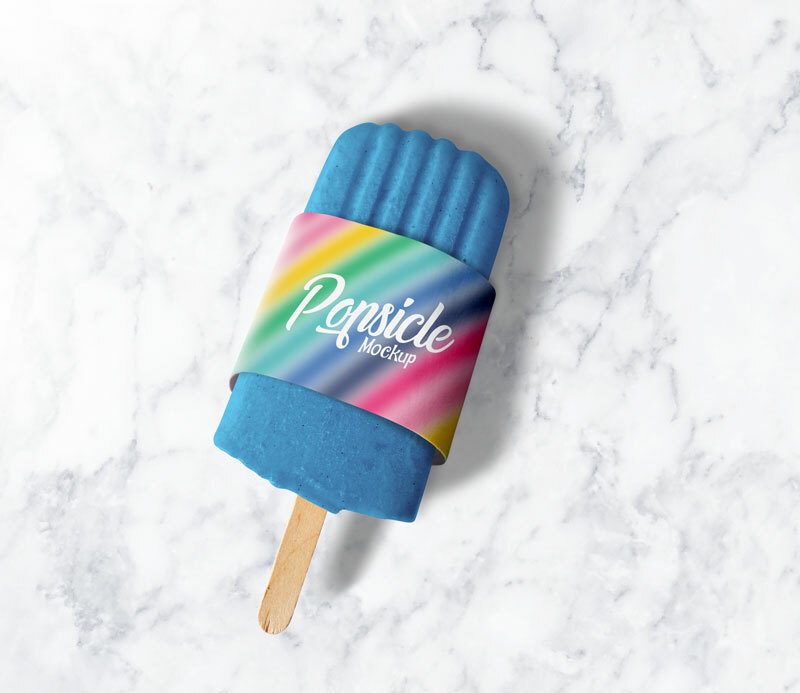 As we are breathing terribly in the air of summer, let me highlight my today’s post which is about a free Popsicle ice-cream packaging mockup that can be used in commercial and personal tasks. Insert in the elements of your choice and as demanded by your client. This mockup can be used as a presentation and you can create it emphatically by using this Popsicle mockup/ let us know how you are going to spend your summer vacation and we shall be happy knowing all your summer stories. Stay tuned for the most updated design feed, our team of professional designers work very hard every day to create, produce and bring out the best for you all. Stay shining till you blaze the sun, good day guys! 2. Layers are hidden to decrease the size of file kindly unhide and place your design on red colored layer. 3. Say thanks if you like or share/tweet with your friends. Do You Want To Know The Most Favorite Colors Of 2019?